MILWAUKEE (AP) The Milwaukee Brewers bring out the best in Chad Kuhl. ”He’s got a real good arm. He’s throwing hard. 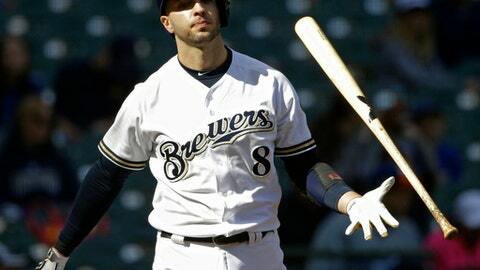 There was obviously no pressure on him at all today,” Brewers manager Craig Counsell said. ”When you don’t hit your spots and you pitch in a place like this, and if the ball’s up a little bit, balls are going to tend to fly out of the park,” Anderson said. ”There was not much good to report about today’s game,” Counsell said. Milwaukee has been shut out seven times in 35 games after being blanked eight times last season. Milwaukee was shut out three times in a four-game sweep by the Cubs in late April. ”It’s a big number already, for sure,” Counsell said. Brewers: C Stephen Vogt (right shoulder), on a rehab assignment at Double-A Biloxi, came out of Saturday’s game after making a throw on a steal attempt. Vogt is scheduled to return to Milwaukee to be examined. … All-Star closer Corey Knebel (left hamstring) pitched Saturday at Biloxi and was scheduled to pitch again Sunday. ”He’s on track to join us at the end of the week at the latest,” manager Craig Counsell said. … LHP Boone Logan (left triceps) is scheduled for at least one outing at Triple-A Colorado Springs after consecutive appearances Friday and Saturday at Biloxi. Pirates: RHP Ivan Nova (2-2-, 4.01) us scheduled to open a two-game series at the Chicago White Sox on Tuesday. Nova allowed eight runs – five earned – and 11 hits in 4 2/3 innings in his last start.